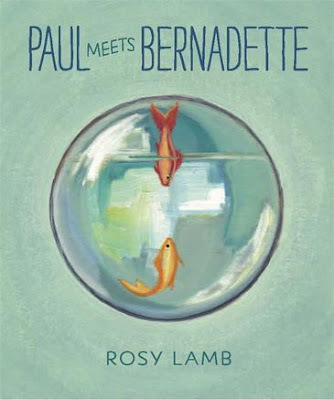 I first learned about Paul Meets Bernadette at Jen Robinson’s Book Page, a blog I try to read as often as possible because Jen makes me think, and finds great gems in children’s books. Paul Meets Bernadette is subtitled “ A goldfishy love story”, was created by Rosy Lamb and published by Walker Books Australia (2014). A stunningly original, funny, touching, luminous, exquisitely illustrated, thought-provoking, one-of-a-kind, must-read, must-read-again, laugh-outloud, myriad-more-eulogistic-adjectives, sparkling diamond of a story. Goldfish are not the most common of characters in media. How much scope is there for Paul, living as he does in a bowl? He can swim in clockwise circles, then for a change try anticlockwise circles. Basically though, like many of us perhaps, Paul must feel as if he goes round and round in circles. One day, another goldfish - Bernadette - drops in. Suddenly she prompts Paul to look beyond the bowl, and reveals a whole new and entrancing world to him. No longer does Paul swim around his bowl. Now he swims around Bernadette. I really like that you can share Paul Meets Bernadette with different ages, and they will not only enjoy the story but take different things from it. Littlies will love using their imaginations to look through Bernadette’s eyes at everyday objects: a banana is a boat, a tea pot is an elephant. Older children will love the humour but also appreciate the love story, subtly told through images and words. The oil painted illustrations are textural and unusual - they enhance what to me is a unique and thought-provoking children’s picture book. Find teaching notes via Walker Books Classroom. Check out more Children's Book Reviews on The Book Chook by clicking Reviews in the right sidebar.